Email, or electronic mail, is the most common method of exchanging digital messages and remains one of the most popular services currently available via the Internet, with over 90% of US Internet users actively using email. Here you’ll find an overview of the modern email system and infrastructure, as well as its origin and use. For a shorter, less technical overview, please see Are You Confused By The Technicalities? Email systems consist of computer servers that process and store messages on behalf of users who connect to the email infrastructure via an email client or web interface. When someone sends an email, the message is transferred from his or her computer to the server associated with the recipient’s address, usually via a number of other servers. A user (Alice) sends an email message and connects to an SMTP (Simple Mail Transfer Protocol) server as configured in her email client or Mail User Agent (MUA). On the SMTP server, a Mail Transfer Agent (MTA) looks at the recipient address and looks up the domain part of the address to determine its destination. …the SMTP server will send the message to that server via the SMTP protocol. The receiving server will store the message and make it available to the recipient (Bob), who can access it via web, POP, or IMAP. Email was actually invented before the Internet itself, and was a crucial tool in the development of an interoperable computer network. Email is believed to have originated at MIT (Massachusetts Institute of Technology) in 1965 to allow users of a local time-sharing mainframe computer to communicate with each other. This quickly evolved to systems that could communicate with other, compatible systems, and from 1969 the ARPANET computer network of the United States Department of Defense experimented with inter-system email transfers using the now familiar “@” sign to separate usernames from machine names. From the early 1980s networked personal computers on Local Area Networks also started supporting simple email systems. When ARPANET later evolved into what we now know as the Internet, email was already the standard method of communication. Email servers are responsible for receiving, storing, forwarding, and delivering messages to and from email users. 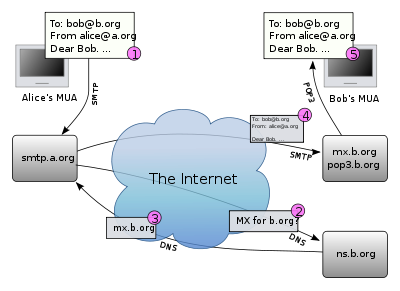 Messages are exchanged between servers using the SMTP protocol with various MTAs (Mail Transfer Agents) such as Sendmail, Postfix, qmail, or Exim. Messages can be stored on the server for the user to access, they can be downloaded and stored in the email client for offline use, or stored both places. When an email server accepts a message it is obliged to deliver it, or otherwise return a delivery failure message to the sender. This ensures that an email message cannot disappear into thin air and implies that the sender of an email can trust the integrity of the email system. Occasionally a message can be neither delivered nor returned, usually as a result of a spam message to a non-existent recipient from a falsified sender address (see What Is Spam and How To Avoid It for more information). SMTP servers: A Simple Mail Transfer Protocol server can refer to either a physical computer or a Mail Transfer Agent (MTA), which is a software program running on the machine. The MTA receives and delivers messages to and from other email servers, and from email users (also known as “relaying”). POP servers: A Post Office Protocol server is a piece of software that gives an email user access to the email stored in the user’s account on that server. The user can download the messages using a MUA (email client) and store the email locally for later viewing. IMAP servers: An Internet Message Access Protocol server is a software program running on a server that provides full access to all the folders the user has created on the server. The email user can synchronize all the folders and messages on the server with the data stored locally using a MUA with IMAP capabilities. A user can access the email messages stored on an email server using an email client or Mail User Agent (MUA) such as Outlook, Thunderbird, and Eudora. The MUA connects to the email server via POP to download messages from a folder, or the more advanced IMAP protocol to synchronize all messages in the folders that exist on the server. When the user sends a message, the client connects to the server using the SMTP protocol. A Webmail interface is a web-based email service that is accessible in a web browser such as Internet Explorer or Firefox. Most email services offer web interfaces to the email stored on the server. So-called webmail services are often faster because they access the stored data more directly via a web browser without the user having to download a piece of software that has to be set up and configured locally. The enormous popularity of email has induced a large number of email services offering various types and levels of email functionality and related services. Although most ISPs (Internet Service Providers) include simple email services with their accounts, many people prefer dedicated email services that provide more storage space, more functionality, other integrated communication services, etc. The free service segment is dominated by companies such as Google and Microsoft that make money from advertisers who pay to expose the email users to advertisements. GMail, for instance, shows so-called contextual advertisements that relate to the actual content of the message being displayed. This has raised privacy concerns among some users, although many users instead focus on the benefits such as large storage space and user-friendliness. Subscription-based services often provide more dedicated email services as they depend on customer loyalty to support their existence. Typically they offer more professional services with more advanced functionality, integrated with email and web hosting services, and they are usually ad-free. Paid services often provide better customer support as they are required to be more dependable than the free alternatives. The actual email message contains text and characters that represent delivery information and content, and must adhere to certain standards defined by IETF (The Internet Engineering Task Force) to ensure that it can be properly handled by the various computer systems that will process it. An email message consists of two main sections: The header and the body. The header can be thought of as the email equivalent of a regular envelope, and is structured into fields (lines) containing information about the sender, receiver, subject, date, etc of the message. It also includes one entry for each server that has processed the message on its way from sender to recipient, which is very useful for tracking its origin — especially if the message looks suspicious (for instance in phishing attempts). 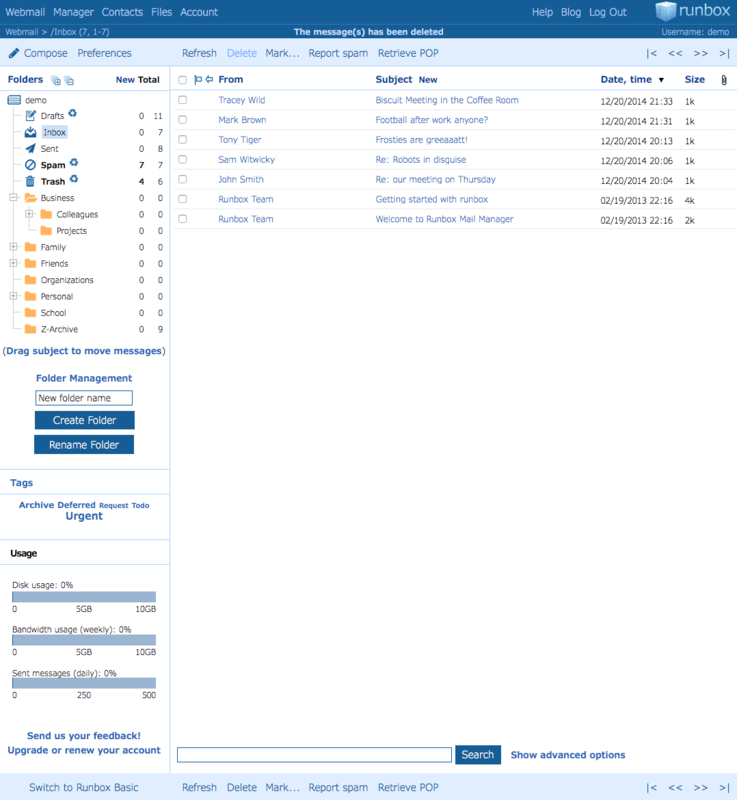 In Runbox Webmail you can click the “View full headers” icon to the top right in the message view mode to view all the headers of a message. More information: IANA’s (The Internet Assigned Numbers Authority) full list of possible message headers. The message body constitutes the content of the message, and can include several parts and attachments in many different formats. In the early days email only contained plain text in ASCII format, but as email usage has evolved it has become necessary to support both HTML and other types of content. Today, email messages are usually encoded with the MIME (Multipurpose Internet Mail Extensions) standard that allows email to support text in various character sets, attached files, multimedia content, etc. Since such messages can contain both information and small pieces of software not apparent to the user, care should be taken by the recipient when opening HTML messages or attachments in a client — or use Webmail which is more secure as possible malicious software in the message can’t easily be run on the local computer. To view the entire email message source you can click the “View source” icon to the top right in the message view mode. In modern society people increasingly use email and other forms of digital communication to create and maintain social networks. Especially in academic institutions and in the business world, email was embraced early on as an effective means of asyncrhonous communication — somewhere in between the telephone and regular mail. With the enormous increase in the number of email messages sent and received worldwide in recent years, it has become increasingly important to employ filters that can sort out legitimate email and user-friendly interfaces that simplify the task of processing messages. Because email is an extremely cost-effective means of communication that allows a user to send large amounts of messages to a great number of recipients, it has become a very popular tool for spreading information and software programs that are unsolicited and/or malicious. Spamming is the act of sending unsolicited commercial (or bulk) email, often to large numbers of recipients. Today it is very inexpensive to send millions of email messages, and only a few positive responses to an email advertisement can make spamming worthwhile to the individuals that send spam. Runbox includes several powerful spam and virus filters to protect our users from unsolicited or potentially harmful messages, such as SpamAssassin, Dspam, and Clam AntiVirus. See our anti-spam section for information on how to avoid spam. In recent years spammers have increasingly banded with malicious software makers, creating so-called email worms that infect vulnerable computers through email, multiply, and spread to other computers (often using contacts from the infected system’s address book), causing a constant barrage of junk email. It is always advisable to use updated anti-virus software on your computer to avoid being infected. See our anti-virus section for information on how to avoid worms and viruses. Email spoofing is a technique to alter the header information of an email to make the message appear to come from a known or trusted source. Spoofing is often used in so-called phishing where individuals attempt to collect personal information in order to access bank accounts or other sensitive services. Because the SMTP protocol was created in a time when email abuse was not yet conceived, it is fairly easy to falsify the content of a message and equally difficult to verify its origin. Several efforts are being made to standardize the verification of email messages such that sources of criminal email activity can be uncovered. We hope this article has contributed to understanding what email is and how it works. If you have any questions about email, feel free to ask in the Runbox Forum or use the Support Center.